Imagine that you are in the middle of a meeting or a party, and you realize that your hair smells bad. Or, you need to go out on a date, and you run out of time when you notice that your hair is smelly. Have you ever found yourself caught in those kinds of situation? Smelly hair is the worst nightmare for everybody, especially when you can’t head to the bathroom and get rid of the smell one and for all. 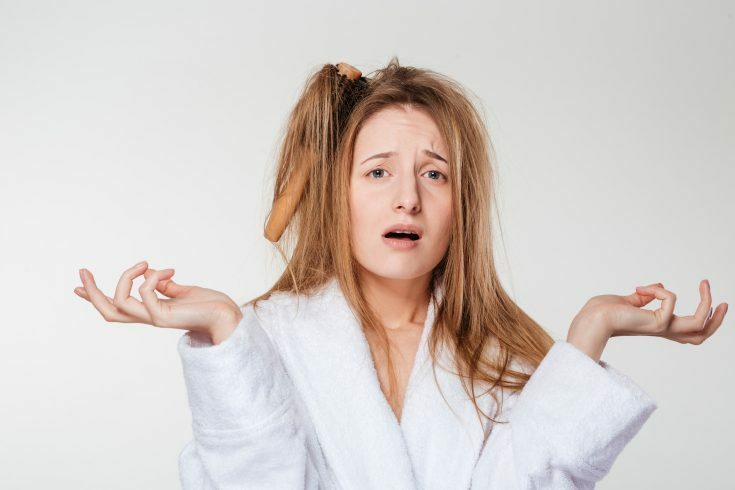 If your answer is yes, you probably have the same wonder as the people who suffer from Smelly Hair Syndrome (SHS): How to get rid of smelly hair without washing it? 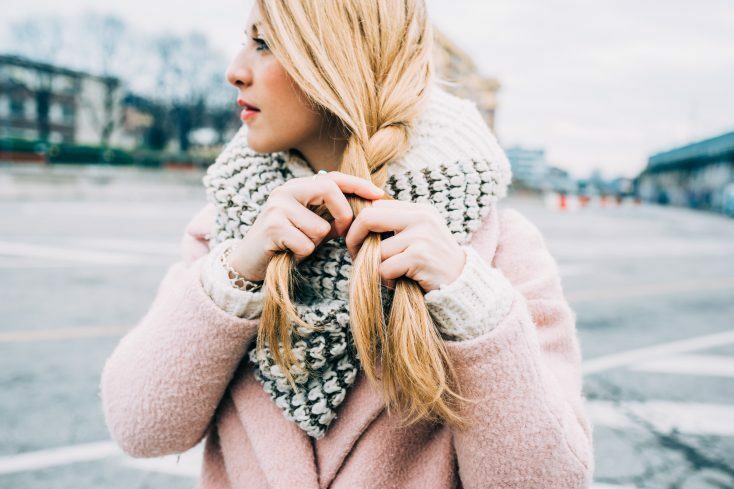 The following article will help you gain a better understanding of your hair type, why your hair is smelly, and how to deal with smelly hair without washing it. To know how to get rid of smelly hair without washing it, we first need to understand what reasons lead to the unpleasant odors of our hair. There are numerous factors to name if you have smelly hair. People with oily hair tend to have smelly hair rather than people with other types of hair. The reason is quite simple. Sebaceous glands, or generally known as oil glands, excrete oil to help moisturize our hair and scalp. However, when sebaceous glands receive false signals that your hair doesn’t have enough moisture, they will excrete extra oil, thus making an ideal environment for bacteria to grow. Sebum (oil) and bacteria work together and cause your hair to smell bad. If you are struggling to find out the best products for oily hair, please read the following article for more information HOW TO BUY BEST SHAMPOO FOR OILY HAIR. Why do our sebaceous glands receive false signals in the first place? The hormone is the one to blame. It’s normal to have a messed-up hormone level; however, in adulthood, this is due to stress, menstruation (for women) and unhealthy lifestyle. When the hormone level in the body is unbalanced, it transmits the wrong signal to the brain and other glands and triggers the excess oil production in hair and skin. During menstruation, or when you are in a stressful period, you will notice that you will easily have acne, your skin gets greasier. So does your hair, and it has an awful smell even if you just have a shower. Being lazy is another reason why your hair is smelling bad. If you don’t wash your hair enough, dead cells from your scalp build up and block sebaceous glands, causing more oils to be produced, along with the bad smell. Some of your practices will cause your hair to smell bad. Some people tend to wash their hair before bedtime and then go to bed with their wet hair. Going out without drying your hair first and then put a hat over your head is also the leading cause of your smelly hair. When your wet hair comes to contact with your bed sheets or your hats, the moisture environment from your hair attracts bacteria from the surrounding area, thus making your hair to smell bad. Touching your hair too often stimulates sebaceous glands to secrete more oil, leaving your hair greasy and smelly. Your scalp is easily affected by any skin diseases such as psoriasis and seborrheic dermatitis. These conditions cause your scalp to peel and produce things that look like dandruff. They stay on your scalp, block the oil glands and cause a bad smell. Are you a big fan of pungent foods? If yes, then you are likely to suffer from smelly hair. Some hair experts suspect that spicy food such as curry and garlic links to your hair’s odor. While whether spicy food leads to stinky hair remains scientifically unproven; however, it should be kept in mind. It may sounds really weird but yes, your pet may be the cause of your smelly hair. The zoophilic fungus is mostly found in animals. If you are too close to cats, dogs, and horses, the fungus will be transferred to your body and hair without your notice. These fungus cause endothrix infections and ectothrix infections . People who have these two infections suffer from the sour smell. This smell is hard to remove even they wash their hair regularly since the fungi love warm, damp environment. Sharing combs with uninfected people can lead to the spread of the infections. 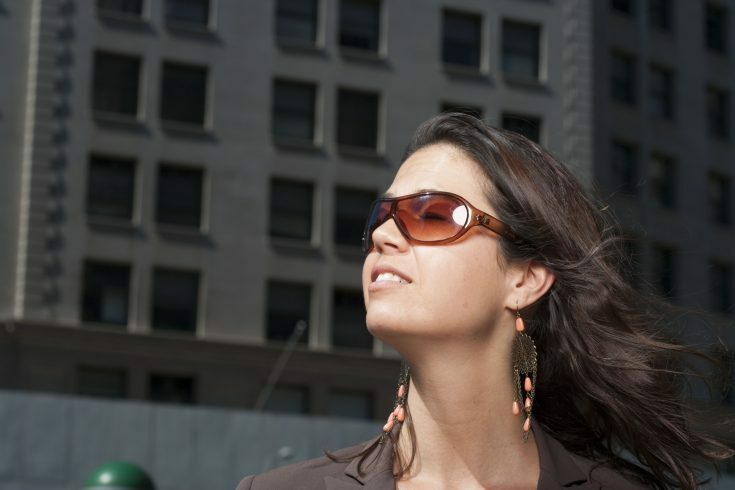 Does pollution cause smelly hair? No one has proven it so far; however, if you work in a restaurant, and cafe, especially in the kitchen and smoking area, your hair is likely to get food and smoke smell afterward. The food and smoke smell are hard to remove by shampoo, and it lingers very long on your hair. How to remove the bad smell of hair? The answer seems to be simple. Whenever you want to get rid of smelly hair, just wash your hair, and the problem will be gone. But what if you are at work? What if you are in the middle of a party? Or you just don’t have time to fix your hair because you are in the middle of something else. Is it possible to get rid of all the horrible smell of your hair without washing it? The answer is yes, and it’s surprisingly simple. So, how to get rid of smelly hair without washing it? A healthy and balanced diet is the ultimate answer for how to get rid of smelly hair without washing it. Washing your hair may help you to prevent the smell within a day but doesn’t stop it altogether. Your way of consuming food does. Since the biggest and most common reason why your hair is smelly is that of the excess oil production. To bring the production to equilibrium, there are certain types of food that you should be aware of before putting in your mouth. So the first step in the how to get rid of smelly hair without washing it guide is to stay away from dairy products. Those include whole milk, cream, yogurts, butter and any products that contain milk. If you are a fan of dairy products for years and find it hard to erase your favorite food in your diet, you’d better swap it with plant-based one. You will find lots of alternatives like rice or almond milk, soybean yogurts and so on. These other options are not only hormone-free but also very rich in nutrients. White rice, white wheat flour, and cereals are processed to store longer. During the process, all of their nutrients and fiber are lost. Some recent studies show that white grains cause blood sugar level in the body to rise. The rise in sugar level in blood links directly to the increase of oil production in our skin and hair. Instead of consuming refined grains, you should switch to wholemeal bread, brown rice, and less-processed food. Sugar is the main culprit of the increase in blood sugar levels. The average amount of sugar one is allowed to eat ranges from 25 gram (for women) to 37.5 gram (for men). However, sometimes we eat sugar without even noticing. Sugar exists in almost any fruits, grains, vegetables, processed and fast food. High level of sugar intake stimulates your pancreas to produce more insulin, thus activating excess oil production in sebaceous glands. How to measure how much sugar you have taken during the day? The answer is to stick with natural sugar from fruits and vegetables since they are beneficial sugar and body-friendly. You should limit the number of fruits per day and make sure don’t consume any additional processed fast food. If you want to get rid of your smelly hair without washing it, this is a must. Water plays a vital role in our healthy life. 70% of our body is water. If your brain notices that you are dehydrated, it will force oil glands to produce more oil to keep your skin and scalp hydrate, thus making your hair oily and smelly. Therefore, you should provide your body enough water during the day. Now you know some of your habits that have been mentioned above annoy your hair’s oil glands, you should consider not to continue those practices any longer. Make sure to dry your hair before going to bed. Don’t touch your hair too often and finally wash your hair every two days to ensure your hair cleanliness. In case you are in a hurry and need to get rid of your smelly hair without washing it, the most efficient way is to use dry shampoo. How can dry shampoo help you to get rid of your smelly hair without washing it? Dry shampoo has the ability to absorb excess oil from your hair, dry out your scalp. The incredible thing is dry shampoo can remove the bad odor from your hair together with the oil. The only thing you need to learn is how to apply dry shampoo for best effectiveness. Start with your hairline. The area around your face should be taken care of first in this process. Divide your hair into small sections and apply dry shampoo. This will help you to apply evenly and don’t miss any parts of your hair. Finally, rub your hair gently to allow dry shampoo to absorb, and your hair is now as fresh and lively as just washed. If you notice your hair has a sour, annoying smell, you should seek medical help immediately because you may be infected with endothrix and ectothrix infections and other skin diseases. You should now consult a doctor to know what to do and how to treat the disease. It’s not easy to take care of our hair, especially when your hair is oily and easy to get smelly. 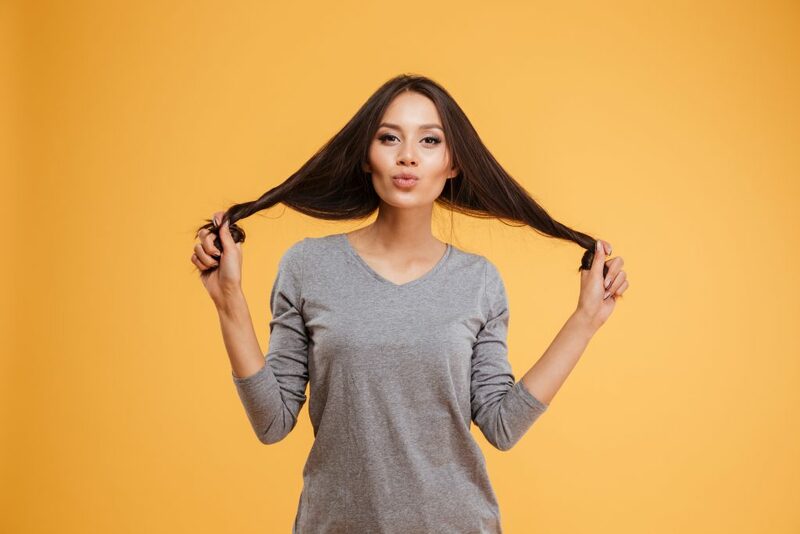 Developing a healthy diet and always keeping your hair condition under control are the keys of how to get rid of smelly hair without washing it. Please LIKE and SHARE to your loved ones to take good care of your hair!